Popular Ghanaian pastors, Prophet Emmanuel Badu Kobi,Bishop Daniel Obinim of God’s Way International Church and Rev. Isaac Owusu Bempah, founder and leader of the Glorious Word Ministry International have hanged out with former President John Mahama together with some men of God. 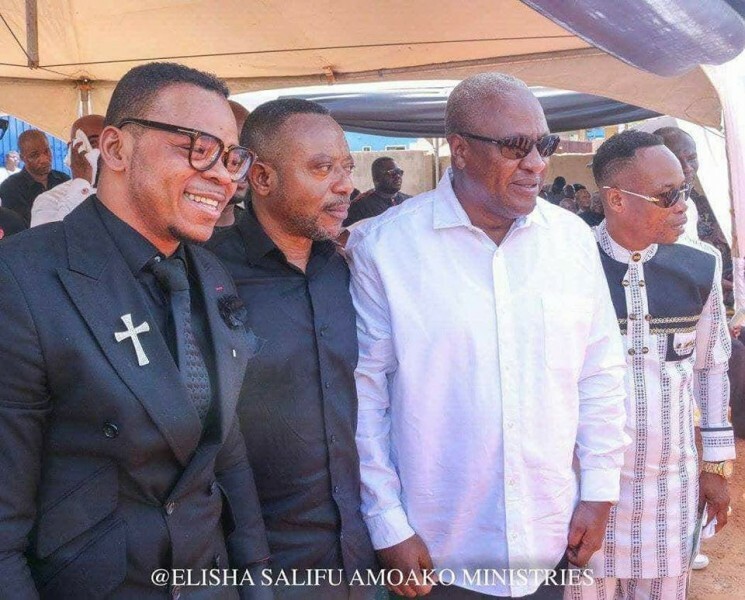 In a picture circulating on social media, one can see Bishop Obinim, Owusu Bempah, Prophet Emmanuel Badu Kobi among others posing to take pictures with the former president. Prior to the elections in 2016, many doubted his prophecy that Nana Addo will win the elections but he was unperturbed and continued to preach a massive victory for him which came to pass. He has also made some staggering revelations about reasons why he believes Mahama is not the right person to be re-elected. Although, he refused to justify his point, the controversial prophet revealed that God was severely angry Mahama as president. The controversial pastor insinuated that Mahama may have been behind the mysterious death of former President Mills. Nana Konadu Spotted At NDP Congress, In NDC Colours?